Vera and Calder were actually very close friends, and this is just one of several designs she made in homage to her friend. I first learned of these scarves from reading what is a must-have book for Vera Neumann fans, Vera: The Life and Art of an Icon by Susan Seid. The book tells all about the close relationship between the two artists and of their mutual respect. 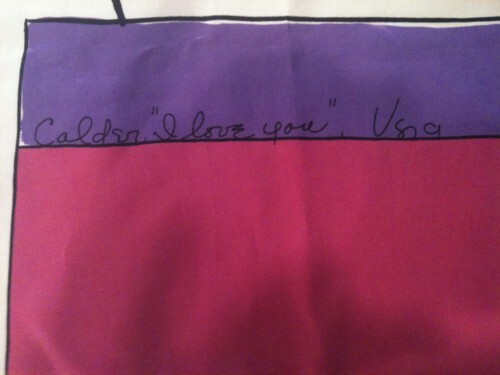 My favorite story is how Calder called Vera one day to tell her he was coming over with a gift for her. She already was a collector of his small sculpture and jewelry, so she was greatly surprised when he appeared with a 14.5 foot tall mobile. It was installed in the yard where it was visible from one of the many large windows in her Marcel Breuer designed house. 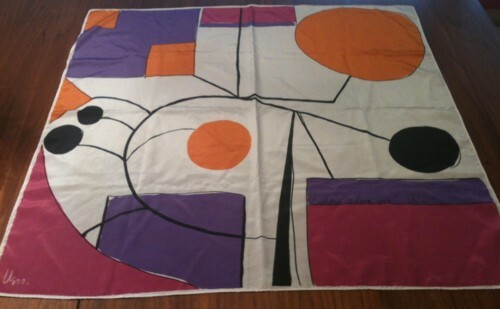 According to Vera: The Life and Art of an Icon, there were three Calder scarves. You can see the original artwork for Janis’ scarf on the left and on the right is an oblong scarf in four different colorways. After Vera made the initial design, her assistants took over and re-imagined the design in other colors. The ones that met with Vera’s approval were put into production. I’m still in the process of narrowing the focus of my own collection, and I’ve chosen three Vera scarves that are now for sale in my etsy store. These are all very good designs, but just happen to be redundant in the collection. The top two photos are copyright Janis Deverter, and the contents of the Vera book are copyright Susan Seid. Please do not copy or repost those photos. when I click on the link or the book, “Vera, the life and art of an icon”, the author is Jen Rienzi. Please clarify. On the credit page it says by Susan Seid with Jen Renzi. I have about 60 Vera scarves. None of them are Calder inspired, sadly. Every time I see one at a thrift, yard or rummage sale, I buy it unless it is terrible condition. And every now and then, I even wear one! My daughter has a Vera scarf that I bought for my mom one Christmas, and it just makes me happy to think of it. Wonderful scarf–and I’m particularly loving the the three oblong scarves in the book that have designs that appear to mimic a Calder mobile. We’re lucky to have a large Calder sculpture in downtown Grand Rapids, and there was a fascinating exhibit about it here a couple years ago, and a Calder exhibit with pieces of his jewelry on display.